Post published on: February 4, 2013. We have undergone a redesign with a new theme based on the Genesis framework designed by Bharath. 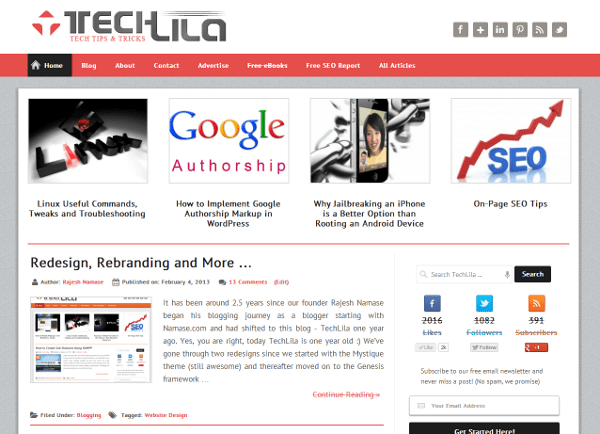 We were earlier using the Streamline child theme upon the Genesis framework and we have decided to use custom Genesis child theme for TechLila. This latest theme is following the web standards and also we’ve added various functionality to it, so now no need to use several plugins. You’ll straightaway notice the color difference as we find this to be pleasing to the eyes and being a not-so-common color also. As you might know, 1366* 768 has overtaken 1024* 768 as the most common screen resolution and our new theme is also better optimized for that screen size. Also, we’ve tweaked a site logo little bit. Well, find out the other changes yourself and do let us know your feedback on the theme in the comment box below. We’re still working on theme to fix some things. We were also joined by two other members, Andor Nagy and Vedant Kumar who contribute heavily to our blog. Andor and Vedant, both are school students and it’s interesting to see interest in blogging in school students. Also Henry Conrad is contributing articles on different subjects, he’s not our official team member, but we can’t ignore his contribution. This year also marked the launch of our SEO tool – SEORobotics.org which analyses each and every aspect of your blog to produce an SEO Report. This site’s algorithm is still being tweaked and optimized and you’ll see a great site very soon. Well, it’s all from our side, enjoy the new design and let us know about any feedback about the theme, content or even why you think the sky is blue in the comment box below. Don’t forget to subscribe to receive latest updates from us. Cool.. I really liked the redesign. Is it a totally custom made child theme or any Genesis child theme redesigned? Hey Rajesh, the site looks great and very professional now. Just one thing that I’d suggest is try to increase the page load speed. This page took very long to load, may be because of java-scripts or something. Page load speed is an important on-page SEO factor after all. Yeah, it’s because we’ve disabled W3C Total Cache plugin, once we sort out other minor issues will enable that plugin then Page Load speed will improve. Thanks for pointing it out. My congrats to Rajesh and his followers with TecLila Birthday :) Wish you bigger traffic and more comments! Thanks Emily for your kind wishes, hope your wishes come true. Awesome look. Its look so stylish and your rebranding with the design is so nice and attractive. Being attractive to visitors will ensure their return to our blogs again and again. I agree with you, if your design and content is awesome you’ll see increase in number of returning visitors, also good design helps to reduce a bounce rate. SEO tool and design is awesome and it is a best design and nice concept. 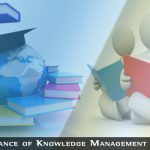 I love articles by Rajesh very much, he is an excellent author and helping to other. I am a fan of your site. Thanks Candy, I’m really happy that you love my articles. There is no navigation menu when viewing from mobile check that. Anyway great job bro, its simple and better readability and overall Techlila looks attractive. Thanks Vivek for notifying we’ll try to fix it asap. Awesome Theme Designing Bro. Loved the Widescreen Look. This is one of the very few Custom Genesis Child Themes which has Widescreen Look, Helps to Grab Attention towards the content rather than sidebars. Yeah, our main focus should be content always, that’s why in this custom design we emphasized more on content :) We’re really happy readers liked the new design. Your changes look cool and give a fresh look of your site. I am hoping to read more wonderful posts in here. Thanks Sarah. We’ll never disappoint you, we’ll try our best to share good articles here. Subscribe to our free email newsletter and never miss a post! wow, looks great. I didn’t read this blog a few weeks (actually this is my first comment) and than this great redesign, well done… congratulation.. Thanks Pina, we’re really happy our reader liked the new design, stay tuned for latest updates. I really like the theme, color design and almost everything that I can expect from a tech site/blog. Any ways Happy Birthday belated. The new design looks wicked, I hope to see more innovative retweaks as the time passes. Till then I wish all the best for you!! We’ll try to improve it more, which things you don’t like from this design? Thanks for your suggestion. We’re using PT+Sans Google font, which font you suggest to use here? You can use Calibri for instance or even Segoe UI font to make it look a bit sleek but that’s just my thought, its upto you though :) cheers!! Thanks for your suggestion, we’ll surely think on it. Congratulations and keep up the good work. Your work is really impressive. Do you make custom designs for Genesis Framework for clients. If yes, one of my friend is very much interested. Please email me if the answer is yes. We can discuss and we can hope for a real good design for my friend’s new website. We’ve asked our theme developer to mail you, thanks Alpesh. Your blog has always been an inspiration for me. I’ve learned many things like tweaking themes and modifying the stuff. And about changes in your present theme: The only thing which looks nasty is “check box” shown below comments section. Those boxes are uneven. I mean I personally feel like. Change it if you feel the same. Hello Rajesh , first of all congrats to you and your site has cool design and good colors choice . hope you will do more good in future. Congratz on the new theme, Rajesh! I liked the orange version better :D But that’s my opinion. Anyways, I hope for the best, and PR 6-7 till 2014! Hope you wishes come true and site will get PR 6-7. I asked many friends and they suggested me to use this red version instead of orange :) I appreciate you for joining TechLila team and contributing resourceful articles. Wow bhai. Really great work on the new design. It is so simple yet so awesome and fast. This is very awesome and easy on eyes. Thanks Ujjwal :) We’re glad you liked it. Hi Rajesh Namase, Awesome Theme bro. This Theme is really cool and looking Professional. Hi Rajesh at first congrats for completing successful 1 year of techlila. Your new theme is really very neat, sharp & professional. Here I have a small suggestion regarding the design of your email subscription option in sidebar. If you make a little modification with the text and subscription button of your email subscription option then it will look very appealing & compact. Rest of all is perfectly alright. wow… I love the design. I’ve never seen such a wonderful redesign before. I think the blog logo is wonderful. Same with the blog hover colour – one hover and you’ll get red; remove it, and you have red. I love that so much. This is one of the best tech blogs I’ve seen since I’ve been surfing online – keep it up. This is one of the best ever theme I’ve seen on Tech blog. Clean and clear.